We’ve been thinking about places you might visit while here at Cross Hall Farm. Cautley is strategically placed for trips out to all points of the compass. In this post we’ll start by travelling north to the Eden Valley. You could go further north and east to Barnard Castle and the Bowes Museum in County Durham as we showed in a post last year but this time we’ll stay nearer to “base camp”. If what you want in the Eden Valley is remote country walking you don’t have far to go. Less than ten miles from Cautley, up the Rawthey Valley and passing Wild Boar Fell on the right, there’s a road down to Outhgill that brings you onto the Mallerstang valley road by Pendragon Castle (sadly now closed to visitors for safety reasons). 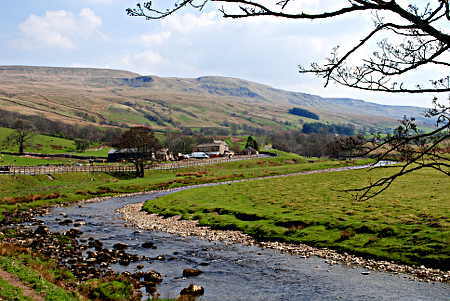 The upper reaches of the River Eden flow down through Mallerstang. Walking options are plentiful. 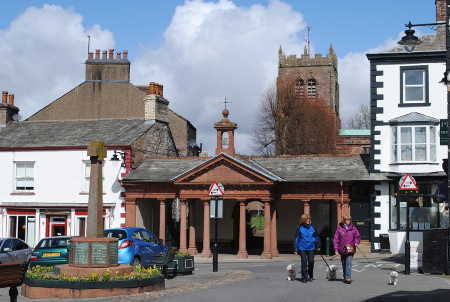 Instead of heading off into the wilds of Mallerstang you may wish to continue on toward Kirkby Stephen, a small market town with plenty to occupy an hour or two, especially if a cup of coffee or maybe more is called for at this stage in the day. Our next stop though is Brough, and whether or not you partook of Kirkby’s culinary pleasures you surely will want to visit Brough Castle. Even if castle history is not your thing there’s the ice cream parlour by the entrance, and a children’s play area. 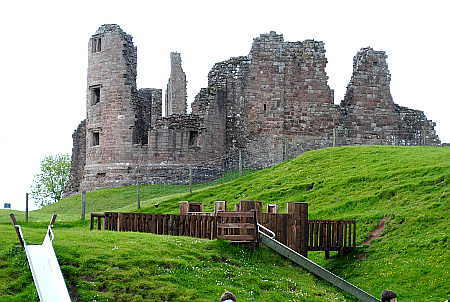 Brough Castle is in the care of English Heritage. Entry is free. There is no information centre but there is a plentiful supply of information boards explaining the history of the castle, and indeed going back to Roman times. Like Pendragon Castle already mentioned this was in the 1600s one of the Eden Valley properties of Lady Anne Clifford, Countess of Penbroke. This area is full of memories of this amazing lady who, in a male-dominated age, fought and fought until she obtained her inheritance including her Eden Valley castles of Pendragon, Brough, Appleby and Brougham. It’s to Appleby that we go next, travelling west along the A66. During the past winter of 2015/16 Appleby was more than once in the news due to flooding from the River Eden following torrential rain in the surrounding hill country and the rest of Cumbria, and this wasn’t the first time recently. 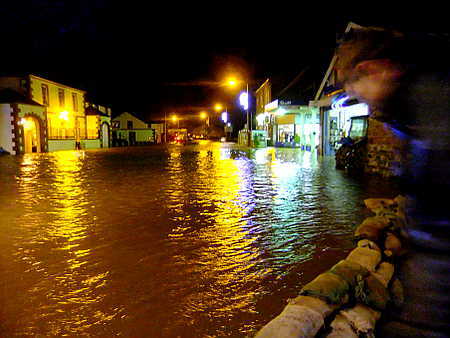 The photograph above was taken one evening in December 2011, and the more recent floods were much worse. 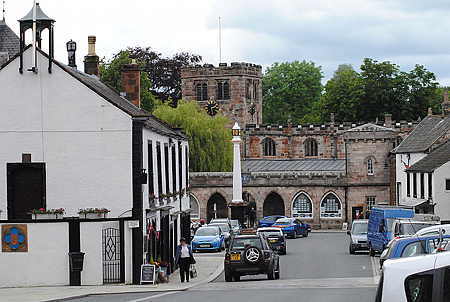 Appleby bounces back, though, and you really ought to pay it a visit. Oh, and don’t forget that its proper name is “Appleby in Westmorland”. Having for centuries been the ceremonial county town of Westmorland people here don’t intend to allow the old county name to die. You can’t spend much time in the Eden Valley without realising that it’s a land of castles, but Appleby Castle is different from all the others; it’s still lived in. For many years it was closed to the public but the present owner has opened it up. Tours take place daily, but need to be booked in advance (see the Appleby Castle web site). This small selection of places to go in the Eden Valley gives just a taste of what’s there to be enjoyed. The River Eden flows all the way to Carlisle, then on to the sea. Its tributaries include the River Eamont, bringing water from beautiful Ullswater in the Lake District down past Brougham Castle to join the Eden. Yes, there’s much more. We’ll add some more places later, but in our our next post will be travelling south from Cross Hall Farm through Sedbergh to Kirkby Lonsdale, then on to Morecambe Bay and the Lancashire coast.